For many, Alzheimer’s Disease or dementia is a mystery condition affecting old people. 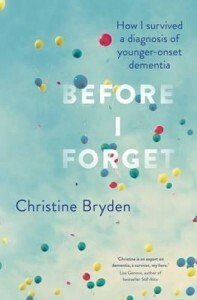 Christine Bryden was 46 when she was diagnosed with dementia, and ‘Who will I be when I die?’ is the beginning of the story of her emotional, physical and spiritual journey since then. Christine is living positively with dementia, and provides a unique insight into how it feels to be gradually losing the ability to undertake tasks most of us take for granted. Her story is remarkable because of the vigour with which she is undertaking this battle in her life and her deep sense that her life continues to have purpose and meaning. 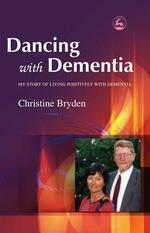 Christine’s approach to health and well-being has made this book a must for many people with dementia and their families. It has been reprinted several times and translated into several languages. 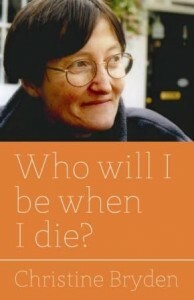 Who will I be when I die? 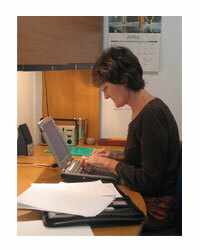 Christine Bryden, Jessica Kingsley Publishers, London, 2012. The neurologist had his back towards me, looking at my scans, said, ‘Your brain is like that of a much older person, showing signs of marked atrophy, particularly at the front. I was only forty-six – old by my daughters’ reckoning, but surely far too young to get an old people’s disease like Alzheimer’s…. ‘Er … how long will it be before I … er … um …’ I stuttered. ‘Until you become demented? Oh, about five years I expect,’ answered the specialist, breezily. The world seemed quite unreal as I walked to my car, as if I were in a dream and soon would wake up to my normal busy life of working in the office and at home every day of the week – fitting in my three girls, shopping, cooking, cleaning, in between. Being a single mum certainly was stressful. for retirement on medical grounds … This was not an uncommon reaction. 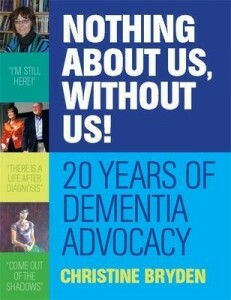 Even friends and family said at first, ‘At least you can’t die from Alzheimer’s! You’ll just be a little more forgetful!’ These misconceptions, about a disease which is the fourth most common cause of death in Australia, dogged us as a family from the time of the first diagnosis. …I sat with a couple of friends in my garden, sharing a pot of tea and some biscuits. ‘You look so well!’ one friend said. ‘Yes,” said the other, ‘I don’t think I’ve ever seem you looking so well.’ But how did they expect me to look? Unfortunately I have a disease of the brain, so you just can’t see the diseased bit of me. My outer shell is fine, it’s just my mental powerhouse that is on the blink! What’s wrong with me is inside my head. I was taking out the washing, when I smelled burning, and suddenly remembered dinner was cooking. I quickly put down the washing to rescue the dinner, but en route walked past the ironing board and realised I was in the middle of ironing too. Clearly I couldn’t continue to do things in parallel if I completely forgot all the other tasks when I was doing just one of them. Either the house would burn down, the clothes would get ruined or dinner would have to be scraped into the bin. … imagine this is happening to you nearly every time you speak – and you know it’s probably going to get worse. Often you wonder whether it’s worth trying to speak, because it always comes out wrong and everyone laughs at you. That’s what it’s like to have Alzheimer’s.